Savvy Spending: Office Depot/Office Max: Free 16 count batteries and Paper after rewards! 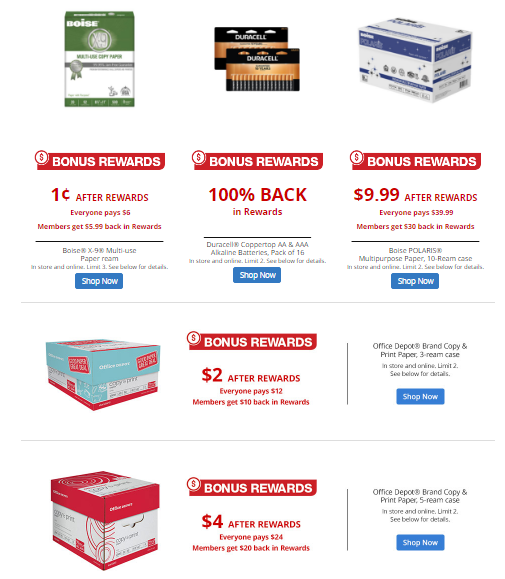 Office Depot/Office Max: Free 16 count batteries and Paper after rewards! Through December 23rd, OfficeDepot/OfficeMax.com is offering Rewards + Members (free to join) a 16-Count pack of Duracell AA or AAA Coppertop Alkaline Batteries for FREE after Rewards (limit 2), both in-store and online! Plus, start at Top Cash Back for an extra 4% cash back in your account! There are even more deals that members can get... go HERE to see them all! Bonus Rewards are different than your normal rewards. Your bonus rewards certificate will be available in your online account within 5 weeks. Simply log in to or create your account at officedepot.com/rewards and click on “View My Rewards Certificates” to view and print your unexpired reward certificates. You can also access your rewards certificates on your smartphone after creating an online account. Reward certificates can be redeemed at any Office Depot or OfficeMax store, online or by phone at 1.800.463.3768. For online purchases, your unexpired certificates are available at checkout.